Bread Bajji is always my favorite snack. I was knowing only simple bread bajji before marriage and years back once we happened to buy bread bajji from a shop and they stuffed potato inside and we liked it a lot. The Bajji was so filling and yummy. Bajji was soft on inside and so crispy on outside. If i have leftover bread inside fridge i used to make simple bread bajji frequently for evening snack. Tasting stuffed bread bajji made me to try that and it came out really well and tasty. 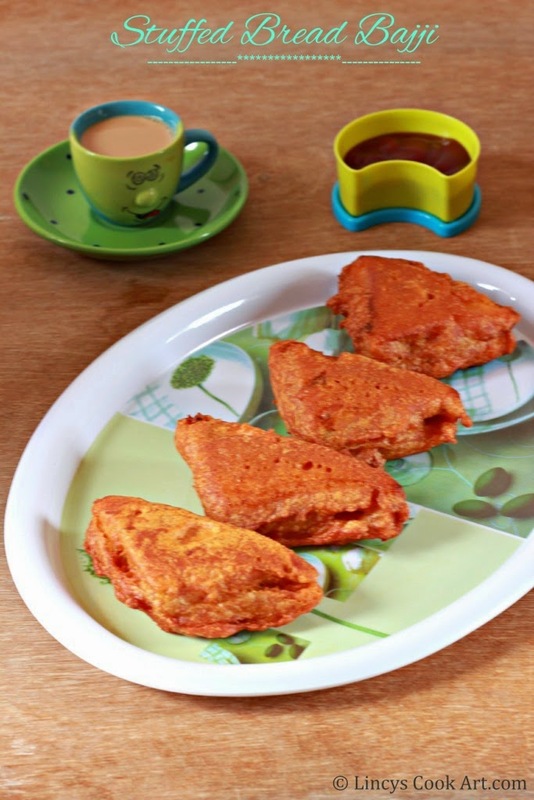 After having this bajji you wont feel hungry any more. A perfect hunger snack. Easy to make snack in minutes. Perfect with a cup of tea in the evening. School going kids love to taste this treat after returning from school with hunger. Left over bread can be utilized in this manner to make this bajjis. This is a must try dish for potato lovers. First prepare the stuffing for the bajji by boiling the potatoes. Pressure cook the potato for 3 whistles on medium flame. Once the steam releases peel the potatoes and mash them with potato masher or with hand. Heat oil in a pan and jeera; then add the chopped onion and green chilli for about thirty seconds. Cook till soft then add the ginger garlic paste and cook till the raw smell leaves for thirty seconds. Add turmeric, chilli powder and garam masala powder and saute for fifteen seconds. Add the mashed potato and salt; mix well till uniformly combined. Add some coriander leaves and switch off the gas. Take a tablespoon of stuffing and spread over the bread slices. Add more filling if required. Flatten the filling well using a palatte knife or backside of the spoon. Cut the sandwiched bread slices diagonally to get two sandwich from one sandwich. If you are using sandwich bread (bigger size)give one more diagonal cut to get 4 sandwich from one sandwich; set aside. In a bowl add gram flour, rice flour, corn flour, Asafetida, chilli powder, baking soda, oil and salt; dry mix with hand or using a spoon. Heat oil in a pan till smoking hot and reduce the flame. Dip the sandwiched bread slices with stuffing inside the batter. Drop the slices inside the hot oil and fry them on both sides till crispy. Drain from oil and keep on top of kitchen towl. Serve hot with tomato ketchup or spicy chutneys. wow that looks so good i am so hungry!! 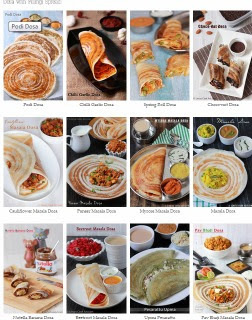 What a coincident, I too prepare it yesterday...all time favorite and serve every fortnight at breakfast. Very addictive snacks ,. Looks delicious . Love the Super Cute Cup, Recipe sounds Delicious!